Polestar’s fast loading, responsive, lightweight and flexible design is perfectly suited for building dynamic pages with your choice of Page Builder and selling with WooCommerce. Polestar features a sticky header, beautiful header search, scroll to top and just the right amount of Customizer theme settings. Page level settings let you adjust the theme layout on a page by page basis, perfect for landing pages. If you run a blog, Polestar is ready with awesome features including a full-width posts slider integrated with Jetpack Featured Content, an author box and related posts section. Clean lines and smooth transitions make Polestar ready for business, blogging and eCommerce. Get Polestar setup in minutes with just the basics or dive in deeper and fully customize your site with just the right amount of settings. Seamless compatibility with SiteOrigin's Page Builder & Widgets Bundle, Jetpack, WooCommerce and many others. Based on the benchmark Underscores starter theme, Polestar's code is thoroughly checked by the WordPress.org team before going live. Polestar's code meets the latest SEO standards giving your site the best chance of ranking well. A modern and minimal design keeps the focus on your content and makes Polestar easy to extend. Designed for the mobile environment, Polestar is responsive and looks great on tablets on phones. Increase your site's page views and search engine score with a great load time. Polestar is lightweight and optimized for speed. 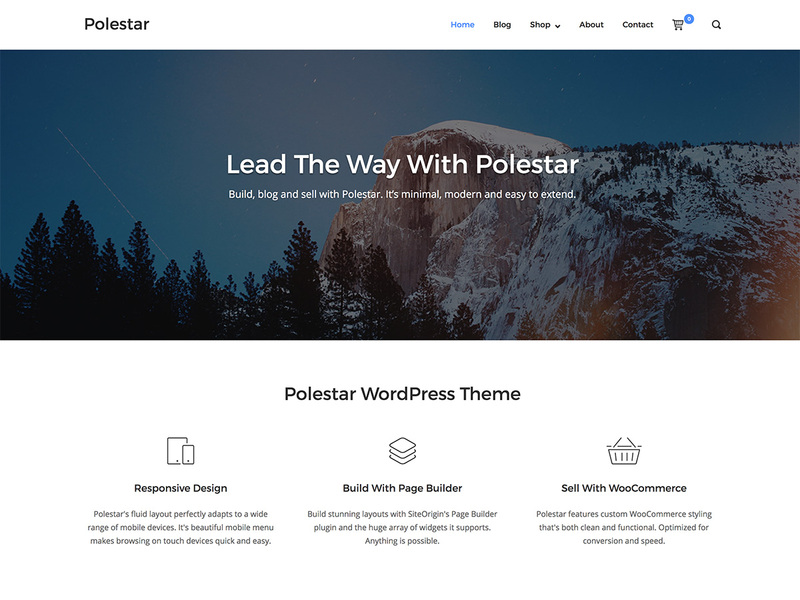 Polestar is a powerful, free WordPress theme. Premium adds a host of useful addons we're sure you'll love. A double sized version of your logo for use on high pixel density displays. Remove the theme attribution link from your footer without editing any code. Take complete control over all theme background, element and font colors. Take complete control over all theme fonts. Adjust header and footer padding and margins. Sticks the header to the top of the screen when scrolling. Replace all header contents with a widget area and build your own header layout. Adapt the theme layout for mobile devices. Use a special responsive menu for small screen devices. Adjust the pixel resolution when the primary menu collapses into the mobile menu. Smooth scroll for internal anchor links from the main menu. Display a scroll to top button after scrolling. Display a breadcrumb using Breadcrumb NavXT or Yoast SEO breadcrumbs. Take control of your blog layout with a complete set of display settings. Allow users to submit comments without a page re-load on submit. Set the sidebar position to right or left. Set the sidebar width as a percentage. Display the WooCommerce mini cart in the main menu. Display a Quick View button on hover on product archive pages. Full WooCommerce support including settings for shop columns, shop sidebar position and product gallery type. Adjust the theme layout on each page or post as required. Included is a full-width option for Page Builder's that require one. Add social network icons to the bottom bar below the footer. Sidebar and footer areas are ready for your preferred widgets. Translate Polestar with a plugin like Loco Translate or use the included .pot file in an app like Poedit. Polestar’s updates as they're released direct to your Dashboard. Support via email or priority forum support. 50% discount on license renewals. An active license gets you premium email support and product updates. A license is valid for one year. Use on a single site. Happy customers are our first priority. If you decide your purchase isn't quite right for you, we'll refund the full price paid within 60 days of purchase.